Pat O’Sullivan & Sons Funeral Directors and Monument Sculptors is located in Clonakilty, West Cork and is located a comfortable hour's drive from Cork City along the N71. There is convenient parking & wheelchair access in all our locations including many lovely restaurants, hotels, Bed & Breakfast accommodations, local churches and cemeteries all within walking distance. 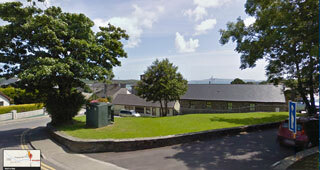 Pat O'Sullivan & Sons continues to grow and expand its funeral services and monumental sculpting and design throughout the West Cork region adding two new locations to include Arundel's Funeral Home of Schull in 2014 and the recent addition of Hurley's Funeral Home of Skibbereen in 2017. 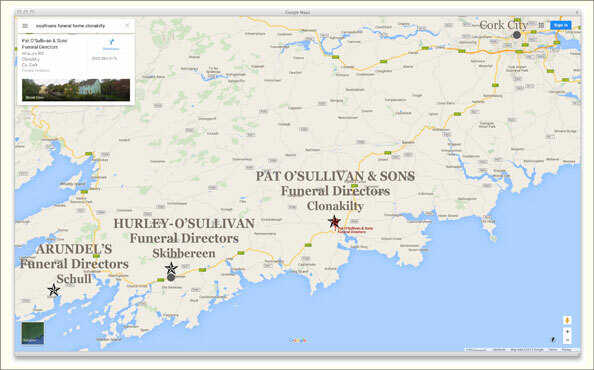 Arundel's Funeral Directors (Schull) is an extension of Pat O’Sullivan and Sons and is located in Schull, Co. Cork on the Mizen Head Peninsula, a 50 minute drive from Clonakilty. 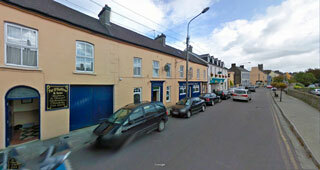 Hurley-O'Sullivan's Funeral Home (Skibbereen) is also a further extension of Pat O'Sullivan & Sons and is a short an easy 25 minute drive from Clonakilty.